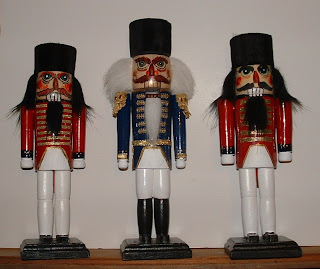 Nutcrackers Represent power and strength. A fierce protector they bare their teeth to the evil spirits. 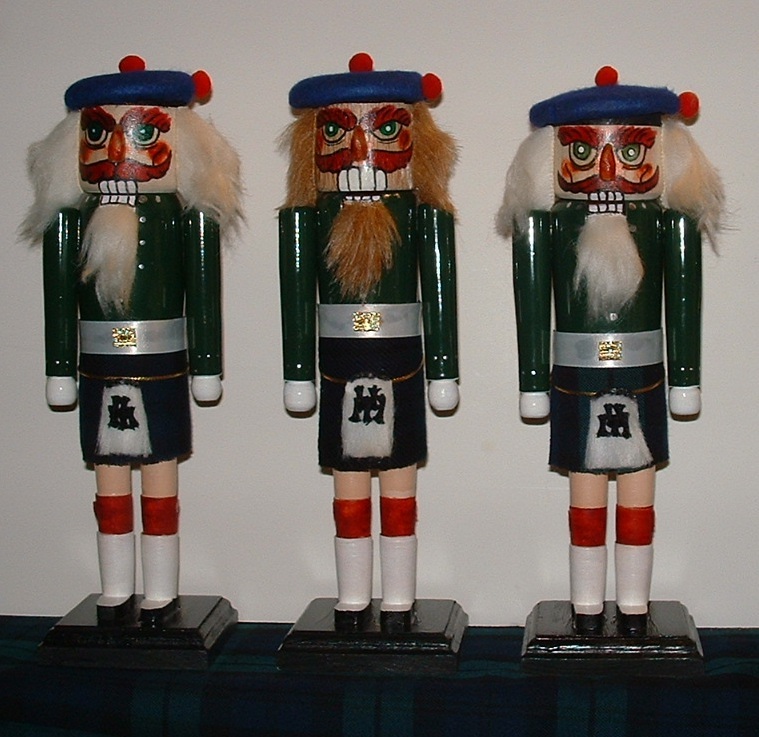 Nutcrackers, an old German tradition have evolved from merely cracking nuts at Christmas into works of art resembling important people, mainly the King's soldiers. They would stand at attention awaiting their orders to work. 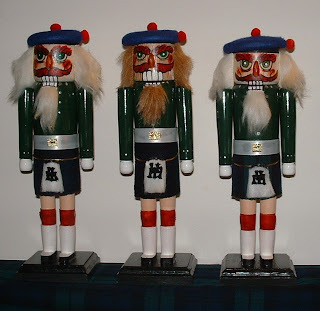 They were used as toy soldiers by children (e.g. "Nutcracker Fantasy") and as a good luck piece to chase away evil spirits. As they waited during the process of being made, their hair and beard grew long, they were given white teeth and big wide open eyes. This helped to scare away the evil spirits. They were given fresh new uniforms and polished boots to complete the appearance, some were given swords. They were now ready to work or start a new adventure with a lucky child, or as a protector of the home. War of 1812 Nutcrackers are intended to represent and honour the soldiers and warriors who were involved in the War of 1812, and the re-enactors who carry on those traditions. We are not merely recognizing the start of this war, but also the almost 200 years of peace between 2 great nations side by side, our histories linked together by this action. 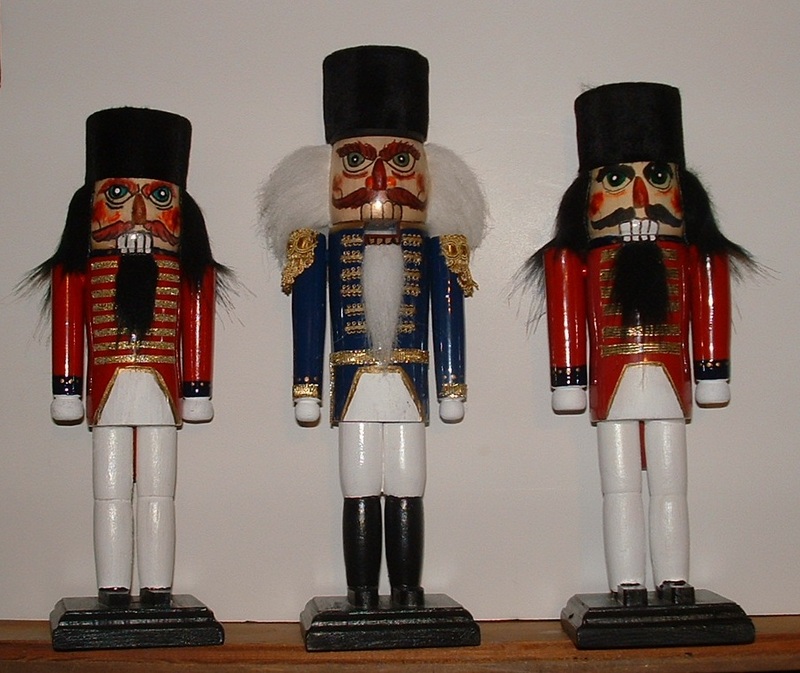 War of 1812 Nutcrackers are all handmade using select materials and I will endeavour to make them appear as close as possible to the original uniforms they represent. Fabric representing some tartans are available in small patterns. If a specific tartan is desired, a piece of material may have to be supplied.